the mysterious source of creative imagination. We are excited to announce the first release by Adam Rudolph's Moving Pictures in over five years. It is a perfect example of creative music looking to the future while expressing the sound of now. The amazing chemistry and collective language amongst the musicians reflects their many years of developing and performing Rudolph's concept. These musicians each have direct and personal connections to the roots and history of jazz as they have performed with and have been mentored by key figures in 20th century creative music such as Ornette Coleman, Yusef Lateef, Roy Haynes, Don Cherry, Sam Rivers, Jon Hassel, and many more. 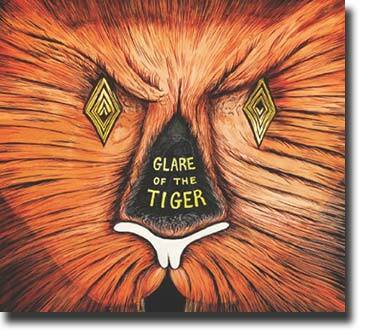 The exceptional and modern recorded sound of Glare of the Tiger was done by long-time collaborator James Dellatacoma, head engineer at Bill Laswell's Orange Music Studio. "This recording is the fullest realization of aesthetic and concept, which I have been developing for the past three decades. My aim was to compose music that inspired the musicians to express their inner voice, while still maintaining a clear focus on aesthetic and overall sound. It is my feeling that to honor tradition, one should look forward and not backward. The tradition is to sound like yourself and create a NEW music that reflects the NOW. To put it another way, Yusef Lateef often said to me, "Brother Adam, we are evolutionists." Dedicated to our dear families: Those here, those gone, and those still to come. "Bristling with energy but balanced with moments of uncanny serenity..laced with transcendent funk grooves and virtuosic soloing." "Glare Of The Tiger is spontaneous, instinctual, colorful, danceable and…most importantly…a hell of an enjoyable listen." "This is music as medicine to help get through the day and smile." "Honestly, the opener is remarkable: and each piece is a treasured gem." "a fascinating inward-looking musical yogic journey…music unbridled in its scope and extent." Please Contact: for concert bookings.